Karst is a term applied to areas where extensive dissolution of rock has led to the development of subterranean channels through which groundwater flows in conduits (enclosed or semi-enclosed channels). These conduits can vary in size from slightly enlarged cracks to tunnels many meters in diameter and many kilometers in length. Karst is produced mostly in areas underlain by carbonate rocks, usually limestones and dolostones. Limestones are usually composed of calcite (CaCO 3 ), and dolostones are composed of dolomite (CaMg[CO 3 ] 2 ). More rarely, other rocks such as evaporites, consisting of gypsum (CaSO 4 · 2H 2 O) have been dissolved to produce karst features. Carbonate rocks are relatively soluble in water that is mildly acidified from dissolved carbon dioxide. Areas of karst topography are characterized by natural features such as sinkholes, which often are seen as circular ponds or depressions, particularly from the air. Other common karst features are caverns, springs, and few or no continuous surface streams (see figure). The evolution of karst topography differs significantly from more typical landscapes where erosion and deposition by running water sculpt the land surface. In karst topography, the underlying soluble rocks are removed by being dissolved instead of being eroded. Sinkholes form where rock has been removed by dissolution, forming an underground void. Where these underground voids have collapsed, a closed depression, or sinkhole, is formed at the surface. The density of sinkholes in some karst regions may reach hundreds per square mile (where one square mile equals about 2.6 square kilometers). Such a sinkhole plain is illustrated in the figure on page 244. This generalized cross-section illustrates karst features such as sinkhole plains, dry streambeds (due to stream piracy), and underground drainageways. Karst topography develops when carbonate rocks are dissolved by water, which, as natural rainwater, is slightly acidic. environmental and physical hazards. The roof of a large underground void or cave can suddenly collapse, swallowing up buildings, roads, and automobiles. 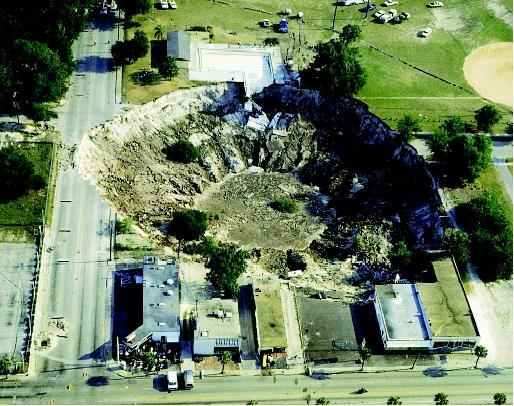 For example, a well-known karst sinkhole opened in 1981 in Winter Park, Florida (see photograph). It swallowed a house, several cars, and parts of a swimming pool. The sinkhole spread to a width of more than 300 meters (984 feet), and took nearly a week to stabilize. In May 2002, a sinkhole developed along highway I-4 near Orlando as the result of drought conditions in central Florida. When the groundwater level dropped, cavities in the bed of limestone beneath the highway began to give way under the weight of the passing automobiles and trucks. Ultimately, drivers were diverted around the sinkhole while repairs were underway, but not before traffic backed up for 13 kilometers (8 miles). Sinkhole formation differs from landslides in that a sinkhole forms when material falls directly into an opening below, whereas a landslide moves downslope, generally along a specific slip surface. In both case, however, gravity is the driving force and can be triggered by the added weight of buildings at the surface. The collapse of a cavern over a large area can create a feature referred to as a solution valley or basin, sometimes referred to as a karst gulf, which from the air resembles a huge sinkhole. These depressions may reach hundreds of meters across and may contain numerous smaller, local sinkholes. Continued dissolution of rock leads to a mature karst, where pinnacles of limestone protrude above a relatively flat plane. This type of topography is called tower karst, after the characteristic steep-sided limestone remnants. Tower karst development, which requires a long period of dissolution, is uncommon in the United States, but is well developed along the Li River near Guilin, China. Groundwater percolating through cracks removes the soluble rock while leaving an enlarged channel for further (and progressively more efficient) flow of water. If there is a thick cover of soil above the soluble rock, surface streams may flow above the subterranean karst drainage system. But more commonly, dissolution features occur at the surface, and hence there are few continuous surface streams because runoff encounters sinkholes or is otherwise routed underground. On May 9, 1981, a large sinkhole collapsed in Winter Park, Florida, swallowing a house, five Porsches at a luxury car dealership, and half of an Olympic-sized swimming pool. The sinkhole collapse occurred when carbonate bedrock had dissolved to the point that it could no longer support the weight of the overlying soil and sediment. The city of Winter Park stabilized and sealed the sinkhole, converting it into a 107-meter-wide (350-foot-wide) urban lake. in a process known as stream piracy. Usually this is a gradual process, with only part of the surface stream being diverted through small cracks in the rock just below the soil cover. The amount of surface water diverted grows larger with time, and the cave also grows with time until the entire surface stream disappears into the ground. Sometimes these disappearing, or sinking, streams provide access to the caves beneath. The downstream end of a karst drainage system usually is a spring where the underground conduit reaches the surface. Typically found in a valley eroded into the carbonate rocks, springs may be very close to the valley bottom, but often emerge well above the valley floor, especially if the erosion of the valley has cut into impermeable and insoluble rocks beneath the soluble layers. In many cases, caves may be entered at karst springs, but sometimes either the water flowing from the spring comes out a hole too small to admit a person, or the passage is completely filled with water. Underground stream systems present special problems for people interested in water supplies and water contamination. Two notable features of karst hydrology are the often-unknown flow paths and the wide variability in flow rates. Some underground flow systems may mimic the behavior of surface streams as one or more underground streams join into a single large stream. But generally, underground systems are quite different than surface systems. Underground streams are not visible from the ground surface and may go in unexpected directions, and may change direction some of the time. The springs where underground streams reemerge to the surface get their water from two main sources: disappearing streams and the diffuse (spread out) infiltration of water percolating through numerous tiny cracks. The presence of a disappearing stream almost always means a large spring somewhere in the downhill direction, and large underground channels carrying the water to the spring. But the actual pathway of the water is hidden from view, and where there are many disappearing streams and springs it is difficult to know which spring is fed by which disappearing stream. In order to understand these underground stream systems, karst hydrologists attempt to determine the sources of springs by water tracing. Water tracing usually involves injecting a tracer chemical, most commonly a harmless fluorescent dye, into a disappearing stream. Springs are then sampled and the water samples are tested for the presence of the dye. A more commonly used tracing method than analyzing spring water for dye involves placing a packet of activated charcoal in the spring and later retrieving it for laboratory testing. Usually the packets are replaced periodically to approximate the time it takes the dyed water to reach the spring from the dye injection site. The charcoal method results in a qualitative trace, in which one can often say that the water disappearing at one location does or does not emerge at one or more springs. Depending upon the frequency with which the packets are replaced, the tracing experiment may provide an estimate of the time it takes the water to reach the spring. Generally this will be known to within a few days or so. SEE ALSO Cavern Development ; Groundwater ; Landslides ; Springs . Tarbuck, Edward J., and Frederick K. Lutgens. Earth, An Introduction to Physical Geology, 7th ed. Upper Saddle River, NJ: Prentice Hall, 2002. Karst. Ground Water Information Pages, U.S. Geological Survey. <http://water.usgs.gov/ogw/karst> . Old-fashioned wells dug or drilled in karst regions sometimes yielded more than water. Crayfish and small snakes were sometimes pulled into subterranean drain-ageways when stream waters were diverted underground by the process known as stream piracy. A person drawing water from a nearby well might intercept these animals as they moved along the flowpath. A common misperception is that most groundwater supplies come from "underground streams" or even "underground lakes." Yet most groundwater used for public and domestic supply occurs in tiny pore spaces in water-bearing sediment or rock formations. Only in specific geologic settings, such as volcanic terrains and karst topography, does groundwater flow in stream-like conduits or collect in underground pools. Hence, the term "underground stream" is a proper descriptor only when it refers to these special conditions.